Don't be fooled by its small size. The SRM150 is big on features and sound quality. Featuring a built-in three-channel mixer and Mackie's powerful 3-band EQ giving you full tonal control of the output. The SRM150 can even be mounted on a mic stand, making it the ideal personal monitor. The SRM150 is perfect for guitar and keyboard players or even vocalists who want full control of their monitor but still need to get their sound to a front of house mixer. Simply plug straight in, then connect the thru output to wherever it needs to go. 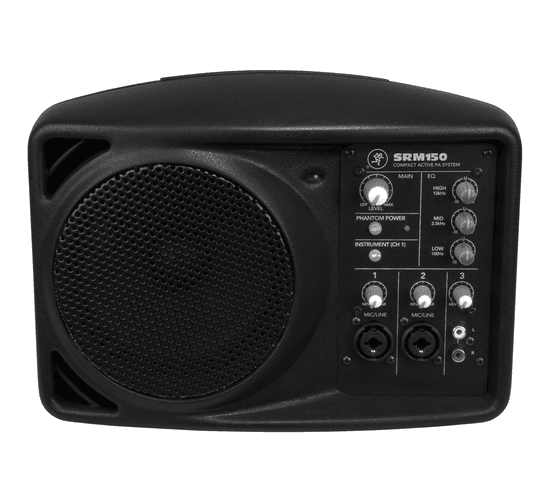 With its instrument and mic inputs, the SRM150 is great for small practice spaces where only two inputs are needed, even hook up a music source to the RCA inputs to play along with your favorite tracks. At the very heart of the SRM150 is a Mackie mixer, with all the versatility and features you've come to expect. True 48V phantom power for powering the most finicky of mics and powerful 3-band EQ for shaping your sound the way you want it. You can even send your output to FOH or more speakers with the thru output. Channels 1 and 2 can be used for mic/line sources, thanks to the handy combo jack, which accepts either ¼" TRS or XLR connections. Channel 1 also has an instrument switch giving you all the benefits of a DI box built right in. There is even RCA inputs so you can connect a smartphone, etc. We’ve matched the SRM150's powerful 150W Class-D amplifier with an equally impressive 5.25" full range, weather-resistant neodymium driver. The SRM150 puts out a blistering 120dB SPL @ 1 meter, far more than the competition offers. The legendary SRM series is known for its unmatched sound quality and road-worthy design and the SRM150 continues that with premium components and a rugged molded cabinet designed to take years of abuse. The SRM150 combines Mackie’s proven mixer and SRM Series Active loudspeaker technologies to create a powerful, great-sounding 3-channel PA system that is ultra-compact, versatile and expandable. The Mackie SRM150 Compact Active PA System is ideal for a wide variety of applications ranging from boardroom A/V to live musical performance in coffee houses, piano bars, or rehearsals, just to name a few. The built-in Mackie mixer provides two mic/line channels that accept XLR or 1⁄4-inch connectors, with switchable 48V phantom power on the mic inputs. Channel 1 can also accept an instrument input directly from a guitar or bass with the press of a switch. A third stereo channel can be used for playing back MP3s, CDs, or tapes. A 3-band EQ is included to adjust the tone and minimize feedback, and a Thru connector provides a line-level output for connecting to a mixer or another powered loudspeaker. The 5.25-inch full-range weather-resistant neodymium driver was speci ed by EAW to handle the 150 available watts delivered by the internal Class D amp. The SRM150 can deliver 120 dB SPL @ 1 meter, which is incredible for its size. The cabinet is constructed of high-pressure injected polypropylene. An insert is provided on the bottom of the cabinet for mounting on a mic stand, using the included mic stand adapter. In addition, a threaded insert is provided on the top of the cabinet for mounting a microphone, using the included mic boom extender. Small club/band PA systems, boardrooms, A/V presentations, classrooms, personal monitor for practice or performance, PA system expansion and many, many more. Dedicated stereo channel for keyboards, CD, MP3, etc.